Catwoman is a fictional character first appearing in Batman #1. After her debut she would appear in many forms of media appearing in the Batman TV series and its film adaption, Batman Returns, the critically acclaimed Batman: The Animated Series, the critically panned film Catwoman, the hit film The Dark Knight Rises and the popular Batman: Arkham series, among others. She has been portrayed by Julie Newmar, Lee Meriwether, Eartha Kitt, Michelle Pfeiffer, Halle Berry, Anne Hathaway and Camren Bicondova and has been voiced by Adrienne Barbeau, Grey DeLisle, and numerous others. Julie Newmar as Catwoman in the first and second seasons (1966-1967) of the Batman TV series. Catwoman in the 1966 live-action television series Batman is portrayed by Julie Newmar and Eartha Kitt. Newmar portrayed Catwoman in the first and second season, and Kitt portrayed her in the third season. The feature film credits Lee Meriwether as both Catwoman and Miss Kitka. All three Catwoman incarnations are described by comic writer, Marc Andreyko, in an afterword to a Batman '66 Meets Wonder Woman '77 omnibus, as being akin to a "Darrin-in-Bewitched bit of silent recasting" and his colleague, co-writer Jeff Parker, liked how their story "leaves no one out and the readers got it immediately", thus reflecting how the change of actress was never specifically addressed. In the TV series, Catwoman was given neither a background nor an alter ego, but focused instead on her costumed aspects. The costume created for the series was similar to the green catsuit appearing in the comics at the time, though it was constructed by Newmar from black Lurex fabric. One of these costumes tailored for Newmar is part of the collection of the Smithsonian Institution. Due to other commitments, Newmar was unavailable for the tie-in film produced after the first season, and for the series' third season. An uncredited Caucasian body double played the role in a cameo in "The Entrancing Dr. Cassandra", the series' penultimate episode. The 2002 television series Birds of Prey included an adaptation of the Silver Age Huntress as one of its main characters. Catwoman was also adapted for the series as she is an integral component of the back story for Huntress. That adaptation was limited to the alter ego, a costume design similar to the one used in the 1992 film Batman Returns, and adding the aspect of the character being a "metahuman". Catwoman was portrayed by an unidentified actress and her appearances were limited to a flashback of her death which was edited into the series title sequence and the rare in-episode flashback. A younger version of Selina Kyle is featured in the TV series Gotham, portrayed by Camren Bicondova., while the adult version of the character is portrayed by Lili Simmons. Selina Kyle is depicted as a 13-year-old thief and orphan who lives on the streets of Gotham City. In the series' pilot episode, she witnesses the murders of Thomas and Martha Wayne. She forms a tenuous alliance with Gotham City Police Department Detective Jim Gordon after he saves her from kidnappers working for the Dollmaker. She promises to help him solve the Wayne murders if he helps her get out of trouble with the law. Gordon arranges for her to stay at Wayne Manor, where she befriends the young Bruce Wayne. She saves him from a gang of hired killers and gives him his first kiss. She also helps Bruce find Reggie Payne, the man who stabbed Bruce's butler Alfred Pennyworth. She pushes Payne out of a window to prevent him from telling the people who hired him that she and Bruce are onto them. In the season finale, "All Happy Families are Alike", Selina meets mobster Fish Mooney upon her return to Gotham City and joins her gang. She disappears during a skirmish between Mooney and Maroni's forces. Camren Bicondova portrays a younger Selina Kyle, an orphaned teenager living on the streets of Gotham City who goes by the nickname "Cat", on the 2014 TV series Gotham. In the show's second season, she starts out working for Oswald Cobblepot. She also helps a young Firefly take revenge on a gang of criminals, and tries to protect Bruce from corrupt billionaire Theo Galavan and his niece, Silver St. Cloud. She teams up with Gordon and Cobblepot to save Bruce when he is kidnapped by the Sacred Order of Saint Dumas. She then briefly takes him to live with her on the streets so he can learn firsthand how criminals operate. She volunteers to help Bruce find out what Hugo Strange is up to at Indian Hill, a secret laboratory in the bowels of Arkham Asylum, but once inside she finds herself threatened by Firefly and Mr. Freeze. However, Firefly ultimately decides to defend Selina, and incapacitates Strange. Selina then offers to help Bruce investigate the secret society behind his parents' murder. In the third season, Selina works for Fish Mooney's gang of Arkham escapees, but leaves them when they get her friend Ivy killed. Selina seeks comfort to Bruce, then spends some time with his doppelgänger 514A, who pretended to be Bruce to know her better. She finds out about him and he kisses her to prove that despite her denial, she has feelings for Bruce. This makes Bruce confess his feelings for her, and after sharing a kiss on a rooftop, they begin a relationship, with Selina helping him steal information from the Court of Owls. However, their relationship is tested, by the arrival of Selina's estranged mother, Maria, who claims to need money to pay off a man who is threatening her. At first Bruce pushes Selina to reconnect with her mother, which she does, reluctantly. Later Bruce sees that she is just using Selina to pull a scam, but goes along with it to avoid hurting Selina's feelings. When Selina sees her mother's true colors, she blames Bruce for not telling her and breaks up with him. Bruce receives a letter from Selina, but it was from his doppelgänger 514A, and she orders him to stay away from her. 514A, after posing as Bruce for several days and dying from the flaws in his experimentation, attempts to get Selina to leave Gotham but she boldly points out that he will never be the man Bruce is and that she doesn't care about him. She attempts to warn Alfred but 514A pushes her out a window, leaving her seemingly killed. However, a group of cats swarm around her, and she is taken to the hospital, where Ivy helps heal her. She comes back to Wayne Manor to kill 514A but is stopped by Alfred, who later discover the truth about the clone. The butler wants her to help him find Bruce but Selina doesn't see what good it will do to her. Alfred calls her a disgrace and forbids her to come back. She then hangs out with Ivy and Penguin but is captured by Tabitha, Barbara and The Riddler. She negotiates her way out by betraying Penguin, protecting Ivy, and gets money to leave Gotham. In the season finale, she tries to make contact with Bruce again after hearing Alfred is severely injured, but he rebuffs her, and she subsequently begins training with Tabitha Galavan. She uses a whip for the first time, successfully pleasing her mentor. In the fourth season,Selina keeps training with Tabitha when Victor Zsasz offers the both of them to enter Penguin's licensed crime system. After Tabitha refuses, Selina goes in alone. At Penguin's club, the relationship between Bruce and Selina rekindles, as Bruce apologizes for his previous behavior while Selina is walking on the rooftop of the Iceberg Lounge. They later encounter anonymously, both dressed as their proto-vigilantes personas. Selina is working for Barbara and Tabitha, she has to steal a knife from Penguin's cargo that Bruce was watching from afar. When Bruce is spotted by Penguin's goons, they open fire and he has to fight his way out while Selina goes back to the Siren's club empty-handed. Bruce later buys the knife at auction and Selina asks him to hand it over to him but he refuses and tells her to leave. When Barbara wants to shut the Sirens down, Selina proves her worth to them by going on her own to steal from the bikers' gang and the Sirens later oppose Penguin after being tasked to capture the Riddler for him. The Sirens then capture Sofia Falcone as an asset against Penguin, then end up working for her to bring the Penguin down, sending him to Arkham and taking over his empire. Bruce and Selina meet again later in the season at the Siren's Club, where Bruce is in the middle of his hard-partying phase following him murdering Ra's Al Ghul, but Selina is able to see through his act and worries about him. After snapping out of his phase, courtesy of Ivy's powers, Bruce asks Selina for help but she is on her way to stop Ivy from murdering innocents and tells him to atone for his actions, especially regarding his behavior towards Alfred. During the second half of the season, Selina is torn between her loyalty to the Sirens, her core values and her affection for Bruce, which causes friction between the three parties. Eventually the two lovers come together again and Selina helps Bruce fighting other villains like Jerome Valeska, a resurrected Ra's Al Ghul and Scarecrow. Bruce gets sprayed by Scarecrow's toxin but Selina is able to reach him and they share a kiss back at Wayne Manor seconds before she is shot by psychotic criminal Jeremiah Valeska, whose only goal was to hurt Bruce through Selina. She survives, but her spinal cord is severed. The fifth season takes place three months after the events of the season four finale. Gotham is now a no man's land and Selina is going through depression since Jeremiah Valeska paralyzed her. The doctors managed to prevent Selina's column from collapsing on itself, although it remains paralyzed. Desperate, Selina tries unsuccessfully to commit suicide; one of the hospital nurses advises Bruce to look for "The Witch" to save Selina. The witch turns out to be Ivy who gives Bruce a strange boil to cure Selina, the boil allows her to walk again but apparently has side effects when her eyes turn green, awaking the darker corners of her nature. Suffering from PTSD episodes where she relives her injury and her kiss with Bruce, Selina decides to don her costume again and asks Bruce for help to get revenge on Jeremiah Valeska. During a fight scene with gang members, Selina deliberately hurts the leader even after he gave her Jeremiah's location, enjoying it to the point Bruce has to stop her from killing him. She later finds Ecco and beats her but Ecco escapes. Selina cuffs Bruce, saying she has been doing it his way and wants to do it her way. She finally find Jeremiah and stabs him nine times in the chest. But she experiences guilt and self-loathing, which she deals with by drinking and pushing Bruce away. Later Penguin comes to her to catch the thief Magpie and the both of them plan to leave Gotham by sea. However it is revealed that Selina is working him to get revenge for him murdering her former mentor Tabitha Galavan. She eventually gives up her revenge to save Bruce from Jeremiah Valeska. They share a surprise date where Bruce expresses his intention to leave Gotham, which saddens her. Ivy walks in, hypnotizing Bruce and leaves Selina in the middle of a fight. Selina gets out and finds Bruce and they both violently fight each other. She manages to snap him out, hitting him, crying she doesn't want him to leave. Bruce kisses her later during Jim Gordon's wedding. Selina then work with Alfred when Bruce and Gordon are kidnapped by Bane. They both try to fight him but he breaks Alfred's back in front of Selina, leaving the butler inconscious. Catwoman was originally supposed to be featured in the Challenge of the Super Friends season of Super Friends as a member of the Legion of Doom. However, due Filmation's The New Adventures of Batman development at that time, Catwoman was restricted to appear in the show. She was eventually replaced with Cheetah. Catwoman was first adapted to television animation by Filmation, for the 1968 series The Batman/Superman Hour. The character design and aspects adapted were similar to those used in the previous live-action television series: a focus on the character in costume, lack of a backstory, and use of the then-current green catsuit. Like the live action TV series, Catwoman behaved like many of her villainous counterparts (Joker, Riddler), by speaking in puns and hiring henchmen who wore outfits similar to hers. Jane Webb was cast to provide the voice for the character. Filmation returned to the character in 1977 for the animated series The New Adventures of Batman, where Melendy Britt was cast to voice the character in four episodes. Again, no backstory or alter ego were presented within the episodes. The yellow and orange costume design used was unique to the series. Catwoman was adapted for Batman: The Animated Series and The New Batman Adventures, set in the same continuity from the DC Animated Universe, voiced by Adrienne Barbeau. A spin-off focused on the character was in production before being cancelled; it was reconsidered years later as a dual spin-off also focused on Nightwing. The character design for Batman: The Animated Series is a long-haired blonde look (based on Michelle Pfeiffer's appearance) when Selina is not wearing her costume, and the costume itself is a predominately gray catsuit based on the costume used in Batman Returns as well, with long black gloves and high-heeled boots. Along with a black portion of the mask, this gives the appearance of a seal-point Siamese cat. When The New Batman Adventures went into development, Catwoman's redesign resulted in an all-black catsuit, blue-white face make-up and short black hair. The first series establishes Catwoman as a socialite and animal rights activist in addition to a costumed thief in the early appearances. Beyond this, no backstory or actual origin is provided within the series. The series does play somewhat on the relation between Batman and Catwoman. She had a crush on Batman, but tried to keep her distance between her and Bruce Wayne. Catwoman also appears in the short featurette "Chase Me". In Batman Beyond, Catwoman does not appear as her ultimate fate after her last appearance in "Chase Me" remains completely unknown. However, she was mentioned by Bruce at the end of the episode "Dead Man's Hand". After the release of Batman Beyond: Return of the Joker, a second movie with an elderly Catwoman as a main character was planned by Bruce Timm, but was finally scrapped. However, in Justice League Unlimited's episode "Epilogue", it was revealed that Selina eventually reformed and became an ally of Batman. Catwoman, as seen in The Batman. Catwoman was adapted along with a number of other Batman related characters for the 2004 animated series The Batman, voiced by Gina Gershon. The character design used was based loosely on the then-current costume used in the comic books. This resulted in a black/dark grey catsuit with a pull-up collar mask, dark red, claw-tipped gloves, a black cowl with exaggerated cat ears, and large amber goggles. She also has blue eyes instead of Green. The initial episode featuring Catwoman establishes her as working as a charity fund raiser in her identity of Selina Kyle. With the remaining appearances focusing on her activities only as Catwoman, an origin for the character is never provided. Catwoman appears in the Batman Black and White motion comics, voiced by Janyse Jaud. Catwoman was among the many DC Comics characters adapted for the 2008 animated series Batman: The Brave and the Bold, voiced by Nika Futterman. Keeping with the tone of the show, the character design used for most of her appearances was drawn from the 1950s through mid-1960s and again from the late 1970 to the mid-1980s. This outfit is the purple long sleeved dress with green cloak and purple headdress/mask with cat-ears. Catwoman appeared in the Batman of Shanghai shorts on the DC Nation block, voiced by Stephanie Sheh. In a departure from the comics, she was portrayed as a Chinese thief active in Shanghai during the 1930s. Catwoman appears in the web series DC Super Hero Girls as a student at Super Hero High, voiced by Cristina Pucelli. Lee Meriweather portrayed the first feature-film version of Catwoman in the 1966 film Batman. The first feature film to include an adaptation of Catwoman was Batman, produced immediately after production of the first season of the 1966 television series of the same name. When the producers realized that Julie Newmar would be unavailable due to prior commitments, they cast Lee Meriwether to portray the character. Return to the Batcave: The Misadventures of Adam and Burt, a television film which aired in 2003, was a semi-documentary of the production of the 1966 television series and film. It featured dramatizations one of which included Julia Rose portraying a young Julie Newmar on set in character as Catwoman. Newmar and Meriwether also appeared in the film. Michelle Pfeiffer portrayed Catwoman in the 1992 film Batman Returns. Catwoman is portrayed by Michelle Pfeiffer in the 1992 feature film Batman Returns. Re-created by Daniel Waters, the character is based on the Selina Kyle from "Catwoman: Her Sister's Keeper". Annette Bening was originally cast in the role but dropped out due to pregnancy. Other actresses including Nicole Kidman, Madonna, Jennifer Beals, Lorraine Bracco and Demi Moore were all linked to the role, and actress Sean Young campaigned heavily to get it (even turning up to Warner Bros. Studios in a homemade Catwoman suit). When it was suggested to Tim Burton that Michelle Pfeiffer was interested, something clicked to the producers thinking "She's perfect. She also could be both Selina Kyle and Catwoman." This version of Selina Kyle is depicted as a mousy, lonely and frustrated secretary of corrupt tycoon Max Shreck. After Selina accidentally discovers Shreck's plot to build a power plant that would steal Gotham's electricity, Shreck attempts to murder her by pushing her out the window of his top-story office. She survives the fall and is mysteriously revived by a group of alley cats that flock around her and begin gnawing at her fingers. When she returns home, she suffers a psychotic breakdown and becomes Catwoman. As part of her larger plan to destroy Shreck, she allies herself with the Penguin, which attracts Batman's attention. Meanwhile, she begins a relationship with Bruce Wayne, at first not knowing that he is Batman. At the climax of the film, Catwoman tries to kill Shreck. Although Shreck shoots her several times, he fails to kill her. She then kills Shreck by kissing him with a taser in her mouth while holding onto an exposed power cable. An explosion ensues, but afterwards, Batman finds only Shreck's charred corpse; Catwoman is not present. As the Bat-signal later shines in the night sky, a figure wearing Catwoman's outfit watches it from afar, suggesting that she has survived. The film's interpretation of Catwoman derives heavily from the Pre-Crisis version of the character. While Catwoman did not return in Batman Forever, she was referenced by Dr. Chase Meridian when she tells Batman: "You like strong women. I've done my homework. Or do I need skin-tight vinyl and a whip?". Burton had no interest in returning to direct a sequel of Batman Returns, but was credited as producer. With Warner Bros. moving on development for Batman Forever in June 1993, a Catwoman spin-off was announced. Michelle Pfeiffer was to reprise her role, with the character not to appear in Forever because of her own spin-off. Burton became attached as director, while producer Denise Di Novi and writer Daniel Waters also returned. In January 1994, Burton was unsure of his plans to direct Catwoman or an adaptation of "The Fall of the House of Usher". On June 16, 1995, Waters turned in his Catwoman script to Warner Bros., the same day that Batman Forever was released. Burton was still being courted to direct. Waters joked, "Turning it in the day Batman Forever opened may not have been my best logistical move, in that it's the celebration of the fun-for-the-whole-family Batman. Catwoman is definitely not a fun-for-the-whole-family script." In an August 1995 interview, Pfeiffer re-iterated her interest in the spin-off, but explained her priorities would be challenged as a mother and commitments to other projects. The film labored in development hell for years, with Pfeiffer replaced by Ashley Judd. The film ended up becoming the critically panned Catwoman (2004), starring Halle Berry. In 2000, Warner Bros. commissioned Darren Aronofsky for an adaptation of Batman: Year One to reboot the Batman franchise. The script featured an African-American Selina Kyle/Catwoman in a prominent role. Patience Phillips was Catwoman but not Selina Kyle of the DC Universe in the 2004 film Catwoman. In 2004, the feature film Catwoman was released. Starring Halle Berry, this film's Catwoman bears little resemblance to the comic book version. Berry portrays Patience Phillips, an artist and graphics designer who works for a cosmetics company called Hedare Beauty, which is ready to ship a new skin cream called Beau-Line that is able to reverse the effects of aging. However, as Patience visits the factory where it is being manufactured, she learns that the product has deadly side-effects. Laurel Hedare (Sharon Stone), the wife of the company's CEO, orders her killed. Hedare's minions drown her, but she is mysteriously brought back to life by Midnight, an Egyptian Mau cat, and from that point on develops cat-like abilities. A researcher named Ophelia Powers (Frances Conroy) tells Patience that Egyptian Mau cats serve as messengers of the goddess Bast, suggesting that Patience has been granted supernatural powers. Wearing a mask to disguise her identity, Patience stalks the night as Catwoman seeking revenge against her murderers. Eventually, her search leads her to Hedare, who murders her husband and frames her for it. In the film's climactic fight scene between Hedare and Catwoman, Hedare falls to her death. Patience is cleared of murder charges, and decides to become Catwoman permanently. The movie alludes to other women who have been granted such cat-like abilities, particularly in a scene in which Patience is introduced to a series of photos of prior Catwomen, including Pfeiffer's Batman Returns version of Selina Kyle. The film's story has nothing to do with the Batman universe, and is considered "Catwoman in name only". It was poorly received by critics and audiences, and is commonly listed as one of the worst films ever made. Jewel thief Selina Kyle disguised as her alter ego Catwoman in the 2012 film The Dark Knight Rises. Selina Kyle is portrayed by Anne Hathaway in The Dark Knight Rises. Entertainment Weekly describes this version as an enigma, a wily and witty con artist, as well as a high society grifter. She is depicted as a femme fatale antiheroine whose actions often blur ethical lines, similar to her portrayal in the comics. In the film, Selina Kyle is hired by corrupt businessman John Daggett to steal Bruce Wayne's fingerprints; Daggett in exchange promises to expunge her criminal record with a "Clean Slate" computer program. Bane subsequently uses Bruce's prints to attack Gotham City's stock exchange and bankrupt Bruce with bogus stock trades. She also steals the pearl necklace belonging to Bruce's deceased mother and takes a congressman hostage. After Daggett betrays her, Selina leads Batman to Bane's trap without realizing that Batman and Bruce are the same person. She attempts to flee Gotham, fearing that Bane's terrorist group will eventually kill her. John Blake arrests her for kidnapping and takes her to Blackgate Prison to await trial. She is subsequently "released" when Bane takes control of Gotham. When Batman returns to Gotham and offers her the "Clean Slate", she aids the Dark Knight in liberating Gotham City from Bane's chaos. With Selina's help, Batman rescues Lucius Fox. Using the Batpod, Selina destroys the blockade at the tunnel leading out of Gotham. During the battle, Selina kills Bane with the Batpod's grenade launcher and helps Batman destroy Talia al Ghul's convoy. At the end of the movie, Bruce leaves the Batman mantle behind and enters a relationship with Selina. She is never referred to as "Catwoman" in the film, although she does receive the moniker in related The Dark Knight Rises collectibles and books. Instead, emphasis is made upon her profession as a "cat" burglar in headlines shown in the film; also, her safecracking goggles resemble cat ears when not in use. Catwoman will appear in Gotham City Sirens. A Crime Syndicate of America version named She-Bat briefly appears in Justice League: Crisis on Two Earths as one of Superwoman's henchmen. This version is a amalgamation of Man-Bat, Catwoman and Francine Langstrom. Eliza Dushku voices Catwoman in Batman: Year One. The DVD and Blu-ray release also features the short film DC Showcase: Catwoman, again with Eliza Dushku providing the voice. Catwoman appears in Lego Batman: The Movie - DC Superheroes Unite, adapted from Lego Batman 2: DC Superheroes video game, voiced by Katherine Von Till. Selina Kyle appears in Batman: The Dark Knight Returns, voiced by Tress MacNeille. Julie Newmar reprised her role as Catwoman in Batman: Return of the Caped Crusaders, which is a continuation of the 1960s television series. The movie includes a brief reference to the Lee Meriwether and Eartha Kitt versions of the character when a hit on the head causes Batman to see a triple image of Catwoman. Newmar reprises the role in Batman vs. Two-Face. Meriwether also makes an appearance as Lucille Diamond, King Tut's lawyer. Catwoman escapes prison by switching outfits with Lucille and trapping the lawyer in her cell. Diamond, upon awakening, finds she enjoys the costume and even begins purring, implying the Meriwether incarnation was a different individual. Catwoman appears in The Lego Batman Movie, voiced by Zoe Kravitz. She is a member of The Rogues, the team of supervillains in league with the Joker. The Brave and the Bold version of Catwoman appears in Scooby-Doo! & Batman: The Brave and the Bold, with Nika Futterman reprising her role. Selina Kyle appears in the animated Gotham by Gaslight adaptation, voiced by Jennifer Carpenter, with Grey Griffin as her singing voice. Catwoman appears in the anime film Batman Ninja, voiced by Ai Kakuma and Grey Griffin in Japanese and English respectively. Catwoman appears as a boss in the 1993 Batman Returns game based on Tim Burton's 1992 film. In the 1999 side-scroller Catwoman video game by Kemco, Catwoman is hired by Talia al Ghul to steal an ancient crystal skull from the Gotham City Museum. Ra's al Ghul wants to use the skull to create a powerful weapon that will be capable of destroying an entire city. The Patience Phillips version of Catwoman appears in the Catwoman video game (a tie-in to 2004's Catwoman feature film), voiced by Jennifer Hale. Catwoman appears as a fighter in the crossover fighting game Mortal Kombat vs. DC Universe, played by Brenda Barrie and voiced by P. J. Mattson. This version is classified as a villain in the game. Her role in the game is small. Her game ending features her returning to Gotham City and discovering that due to the magical essence of the worlds merging, she now has the ability to transform into a black panther at will, enhancing her speed and strength. This incarnation is also referenced in pre-battle dialogue between Sub-Zero and Catwoman in Injustice 2 in which the two recognize one another from their previous encounter. Catwoman appears in Batman: The Brave and the Bold – The Videogame, voiced again by Nika Futterman. In the game, she teams up with Catman to steal an ancient artifact and turn all of the police into cats, in order to terrorize the city easier. Catwoman appears in DC Universe Online, voiced by Kelley Huston. She is classified as a villain and is seen as a member of the Secret Society of Super Villains, although her main plot is considered heroic and far from villainy. Catwoman appears as a playable character in Infinite Crisis, voiced again by Grey DeLisle. Catwoman appears in the mobile game DC Legends. Catwoman appears in Lego Batman: The Video Game, voiced by Vanessa Marshall. She appears as an enemy of Batman, a 1st deputy of the Penguin, and the first boss of Chapter 2 "Power-Crazed Penguin." Her abilities are double-jump, whip attacks, and making guards open love gates (not a mind-control ability). She is the only one of the Penguin's followers (excluding the Penguin himself) that does not have superhuman strength. The Penguin assigns her to steal the Gotham Diamond from the museum in order to power up his machine that controls his penguin bombs. She awes the police by leaping back and forth and she manages to slip away with it. Batman and Robin see her, chase her, and catch up to her, and they can inflict damage on her simply by attacking her, but if there are some of the Penguin's henchmen around, she will leap away. After she is defeated, She and Batman kiss much to Robin's disgust, but she tosses the Gotham Diamond off the building and a cat (possibly hers) takes it. She then struggles against some policemen and hides from them, but Batman lays a bowl of milk to get her attention and throws her in the police van while she is drinking and it drives off. In a prison cell, the same cat brings her the Gotham Diamond. The Penguin saw her get captured and he teams up with Killer Croc to rescue her when he hears she has the diamond. After she is rescued, she gives the diamond to the Penguin, and they go to Gotham Zoo to set up the machine. They power it up and activate the penguins, but Batman and Robin arrive to stop it. She fights alongside the Penguin as a miniboss; although she cannot be damaged, she can still attack the player. When the Penguin is defeated, she tries to sneak away, but Batman just throws a batarang at her. In the ending, she is seen in Arkham Asylum grooming herself. She is one of three bosses that later appears as a miniboss, the other two being Two-Face & Harley Quinn. Catwoman appears in Lego Batman 2: DC Super Heroes, voiced by Katherine Von Till. She is among the inmates freed when Lex Luthor frees Joker from Arkham Asylum. In the level "Arkham Asylum Antics", she rides her motorcycle around the maze. Outside of the main story, she appears as an optional boss at the police station. She has no dialogue other than laughter. Catwoman appears as a playable character in Lego Batman 3: Beyond Gotham, voiced by Laura Bailey. In the game, the primary version's default design is her costume in The Batman with the 1966 and Pre-New 52 designs as alternates. She appears in a side quest in the Watchtower where the player has to help her find a cat statue and she later appears on Ysmault where the player has to help Dex-Starr find a new hangout spot. In one of Kevin Smith's side-quests, she steals the film that Smith made and the player has to find where it is. The 1966 version appears as a miniboss in the bonus level "Same Bat-Time, Same Bat-Channel" based on the 1960's TV show. Also, The Dark Knight Rises version of Selina Kyle is a separate playable character via DLC. The Lego Batman Movie version of Catwoman makes a cameo in Lego Dimensions, voiced again by Grey Griffin. The player has to rescue her in a sidequest. Catwoman appears as a playable character in Lego DC Super-Villains, voiced by Grey Griffin. The character is voiced by Grey DeLisle, where this version has a range of different animations and abilities. Chronologically, she first appears in Batman: Arkham Origins Blackgate. While Catwoman does not appear in Batman: Arkham Asylum, parts of her costume are found on display inside Arkham Asylum's old mansion and scanning them to solve one of the Riddler's riddles will unlock her bio. She is also referenced by the Joker addressing a crate of Venom to the character as a gift, and appears on a list of Arkham inmates liberated by Harley Quinn. She physically appears as a playable character in Batman: Arkham City. She first appears in the prologue of the game, breaking into a safe belonging to Two-Face, in order to retrieve the blueprints of Hugo Strange's confiscated goods vault, where the prison warden is holding loot of Selina's. However, she is captured by Two-Face in the act, is held hostage in his courthouse. Dangling above a vat of acid, Catwoman is given a mock-trial by Two-Face, before being rescued by Batman. She retrieves the blueprints, and seeks out Poison Ivy's help. After some convincing, Ivy agrees to help her break into the vault. Once Catwoman is in, however, Hugo Strange's genocidal Protocol 10 is enacted, and she reluctantly leaves her loot to rescue Batman, who is pinned under fallen rubble and left for dead. After saving his life, she attempts to retrieve her belongings from her apartment and flee the prison-city, only to find a bomb planted by Two-Face. Surviving the explosion, she seeks out Two-Face once again, slashing him across the face and leaving to collect her belongings. She later returns as a playable character in Batman: Arkham Knight. Riddler contacts Batman, and informs him that he has Catwoman hostage, and that in order to free her, Batman must complete a series of trials. With each trial he completes, Catwoman is rewarded with a key that will defuse one of the bombs strapped around her neck. Batman and Catwoman eventually find all nine keys, and Catwoman is free to leave the orphanage where she was hostage. However, she returns when Batman comes back to confront the Riddler, and the two defeat him. After the fight, Catwoman and Batman finally kiss, before Batman pushes her away, telling her this is the last time they will see each other. Later that night, he is unmasked and seemingly kills himself. Catwoman returns as a playable character in the DLC expansion mission Catwoman's Revenge. Taking place the night after Arkham Knight, Catwoman infiltrates one of the Riddler's hideouts while he is in prison. She finds his robot factory underground, and steals all of his money before destroying the facility. In Batman: Arkham VR, postcards from Selina Kyle which correspond with newspaper clippings of various jewelry heists can be found at the beginning of the game. Catwoman appears in the mobile game Batman: Arkham Underworld, acting as an information officer who keeps the player updated on the activities of Gotham City, as well as teaching new mechanics to the player and occasionally giving them missions in the form of favors for her services. Catwoman appears as a playable fighter in Injustice: Gods Among Us, with Grey DeLisle reprising her role from Batman: Arkham City. This version was formerly a part of Batman's Insurgency, but switched over to Superman's Regime prior to the game's story in order to protect Batman. In Catwoman's ending, Catwoman resolves to fight crime in the newly-rebuilt Gotham City until she can reconcile with Batman. In the game, Catwoman has various alternate outfits such as mainstream and alternate as well as the design from Batman: Arkham City. Catwoman returns as a playable character in Injustice 2, voiced again by Grey DeLisle. In the story she appears as a member of Grodd's Society, but is revealed to be a double agent working for Batman. She teams up with Cyborg and Harley Quinn to bring Brother Eye out of Brainiac's control. In her single player ending, she gets together with Bruce after defeating Brainiac, but leaves him after quickly getting bored of the lifestyle. She steals a Mother Box to travel the galaxy stealing as much as her heart desires. This is the first media outside of the comics to reference Selina's sister, Maggie, as Atrocitus is interested in how she affects Selina's rage. Catwoman appears in Telltale Games' Batman series, voiced by Laura Bailey. Like the modern interpretations of the character, she serves as an anti-hero and occasional ally of Batman. Catwoman makes her debut in the first season. She first confronts Batman as she tries to steal a data drive from Mayor Hamilton Hill's office, which she loses during the scuffle. As Selina Kyle, she is introduced to Bruce Wayne by Harvey Dent (whom she is dating) and deduces that he is the vigilante upon noticing an injury she gave him. After being unsuccessful to convince him to give her back the drive, she reluctantly gives him the address where she was to meet her employer. Catwoman also helps Batman stop a Children of Arkham attack on the Mayoral Debate, after he helps defeat an attempt on her life. Though Selina works the group in the hopes of clearing her debt, she later leaves them after being used as a hostage to lure Batman out. After he is critically wounded in a fight with Lady Arkham, she takes him to her apartment to recover and, if the player chooses to, sleeps with him. After Harvey destroys her apartment after finding Bruce there, she either leaves Gotham or stays briefly at Wayne Manor, though leaves after Bruce's incarceration in Arkham Asylum. After both Penguin and Harvey are defeated by Batman, Selina steals a prototype from Wayne Enterprises' R&D department. When caught trying to escape by Bruce, she admits to have only gotten close to him for another job. After returning the device, Selina leaves Gotham to distance herself from the conflict. Depending the player's actions, she will either stay in contact with Bruce, sending a cat themed postcard to him during the epilogue, or cut him off completely. 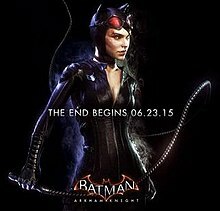 Catwoman returns in the second season, titled Batman: The Enemy Within. Prior to her return, Selina's postcard and broken goggles appear in the Batcave as part of her display. After the Pact retrieves Riddler's body from the Agency, it is revealed that she had been hired by them to assist in their heists. Catwoman is also mentioned to have been an associate of the Riddler, having been convinced to join them by the criminal. Though she works with the Pact to help uncover the location of an Agency black-site, she secretly tries to sabotage their plans in retribution for their supposed involvement in Riddler's death. Eventually, Selina decides to work with Bruce to stop them, during which she can be invited into the Batcave and enter a relationship with him. During the climax of the third episode, Bruce is forced to give either himself or her up as a traitor. If the former is chosen, she can help Batman defeat the Pact and flees the scene as the Agency arrives. However, regardless of what is chosen, she is captured by the Agency and made part of their supervillain program. Depending on whether the Joker becomes a vigilante or criminal, she either takes part in the fight between Batman, Joker and the Agency, or is used within Joker's attempts to get revenge on Batman. Depending on the choices made, Catwoman can either be released by the Agency, put under surveillance or kept to work for the organization. Catwoman, voiced by Lorelei King, appeared in the Batman radio drama The Lazarus Syndrome (1989). ^ Based on the credits for the role of Catwoman. ^ Moore, Booth (January 24, 2011). "Catching up with the original Catwoman, Julie Newmar". Los Angeles Times. Retrieved January 24, 2011. ^ a b Smith, Ronald L. (2004). "Julie Newmar: The Very Last How to Book - Biography". Archived from the original on July 1, 2007. Retrieved June 22, 2007. ^ "Pilot". Gotham (TV series). Season 1. Episode 1. September 22, 2014. Fox. ^ "Harvey Dent". Gotham (TV series). Season 1. Episode 9. November 17, 2014. Fox. ^ "LoveCraft". Gotham (TV series). Season 1. Episode 10. November 24, 2014. Fox. ^ "All Happy Families Are Alike". Gotham (TV series). Season 1. Episode 22. May 4, 2015. Fox. ^ "Damned If You Do...". Gotham (TV series). Season 2. September 21, 2015. Fox. ^ "By Fire". Gotham (TV series). Season 2. Episode 6. October 26, 2015. Fox. ^ "This Ball of Mud and Meanness". Gotham (TV series). Season 2. Episode 14. March 14, 2016. Fox. ^ "Transference". Gotham (TV series). Season 2. Episode 22. May 23, 2016. Fox. ^ "Smile Like You Mean It". Gotham (TV series). Season 3. Episode 12. January 23, 2017. Fox. ^ "No Man's Land". Gotham (TV series). Season 4. Episode 22. May 17, 2018. Fox. ^ Based on the credits of the episodes featuring Catwoman's appearances since they specifically list Adrienne Barbeau as the actor providing the character's voice. ^ "The World's Finest - The DC Animation Resource". www.worldsfinestonline.com. ^ "Holy reunion! West, Ward in 'Batman' film". CNN.com. March 4, 2003. Archived from the original on February 26, 2007. Retrieved June 22, 2007. ^ "Return to the Batcave: The Misadventures of Adam and Burt (2003)". Movie Gazette. June 10, 2005. Retrieved June 22, 2007. ^ Paul. "Pfeiffer on Returns & Hathaway". Batman Online.com. ^ "From Comic To Pfeiffer's Cat". Batman Online. May 29, 2012. Retrieved September 6, 2012. ^ Michael Fleming (1993-06-17). "Dish". Variety. Retrieved 2008-08-14. ^ Michael Fleming (1993-07-22). "Another life at WB for Catwoman and Burton?". Variety. Retrieved 2008-08-14. ^ Michael Fleming (1994-01-13). "Seagal on the pulpit may be too much for WB". Variety. Retrieved 2008-08-14. ^ Tim Egan (1995-08-06). "Michelle Pfeiffer, Sensuous to Sensible". The New York Times. ^ Michael Fleming (2001-04-02). "WB: Judd purr-fect as Cat". Variety. Retrieved 2008-08-14. ^ "Catwoman". Rotten Tomatoes. Retrieved 2008-08-15. ^ Brian Linder (December 6, 2000). "Aronofsky Talks Batman: Year One...Again". IGN. Retrieved October 17, 2008. ^ "Anne Hathaway to Play Selina Kyle in The Dark Knight Rises". ComingSoon.net. January 19, 2010. ^ Jensen, Jeff (January 19, 2011). "'The Dark Knight Rises' scoop: Anne Hathaway, Tom Hardy join cast". Entertainment Weekly. Retrieved January 19, 2011. ^ Kit, Borys (April 20, 2011). "'Batman: Year One' Lines Up Voice Cast, Sets Comic-Con Premiere (Exclusive)". The Hollywood Reporter. Retrieved June 18, 2011. ^ Hale, Jennifer (9 July 2014). "@MattMcMuscles yep". ^ "Infinite Crisis - Behind the Voice - Grey DeLisle-Griffin as Catwoman". YouTube. Retrieved August 24, 2014. ^ "DC Legends: Catwoman - The Princess of Plunder Hero Spotlight". YouTube. Retrieved February 21, 2017. ^ "LEGO Batman 3: Beyond Gotham - Catwoman (1966, Pre-52, Standard) Gameplay and Unlock Locations" (18 November 2014). Retrieved 9 April 2015. ^ "New Lego game lets you team up with Joker, Harley Quinn and other DC bad guys". 2018-05-30. ^ Hamilton, Kirk. "Get A Load Of Catwoman Clawing It Up In Injustice: Gods Among Us". Kotaku. ^ Grey Griffin [@GreyDeLisle] (March 3, 2017). ""This kitty is purrrfectly happy to be back as #Catwoman in #Injustice2!"" (Tweet). Retrieved March 9, 2017 – via Twitter. ^ Sliva, Marty (12 June 2016). "E3 2016: Batman: The Telltale Series' First Screens, Cast Revealed".